I have to say it's a treasure being able to see your creative process and learn all the ins and outs of it. Not too long ago, a story went ‘round the internet that I had “just” stopped doing thumbnails. Some were quick to pounce on this as the reason for the supposed decline in my work since (pick a date). Snag was, the report could only have come from someone who’d been snoozing whilst playing journalist, since what I’d actually said was that I’d stopped doing thumbnails before I got into the Biz. So, yes, I start with a pretty clear “snapshot” of the whole page in my head and “project” that onto the paper. Ah-ha, I guess page 16 will be the one to ink differently then. If it, and 17, hadn't already been tweaked. Ok, so I had a crack at the first page. What happened to Cyclops? Did he fall into a vat of tar? This is an alternate version with a solid black rendering of his costume I’ve always sort of liked better. @ John Byrne. Hey, I’m not George Perez. Tony M. - you don't need to be George Perez. Besides, the job is already taken. That Tony Marin job looks better for you, honestly. Tho he might try a little harder to be John Byrne. Start by imagining that the pencils are not suggestions, for instance. As crappy as newsprint in comics was, especially in the late '70s and early '80s, I ended up preferring it to those baxter and mando papers where the colors would be so garish it made me ill. It took awhile for someone to adjust their coloring for those bright white papers, and some never did, reprints were never intended for it. Some just made every single thing super air-brushed shiny for no reason even to the point of ruining the readability. 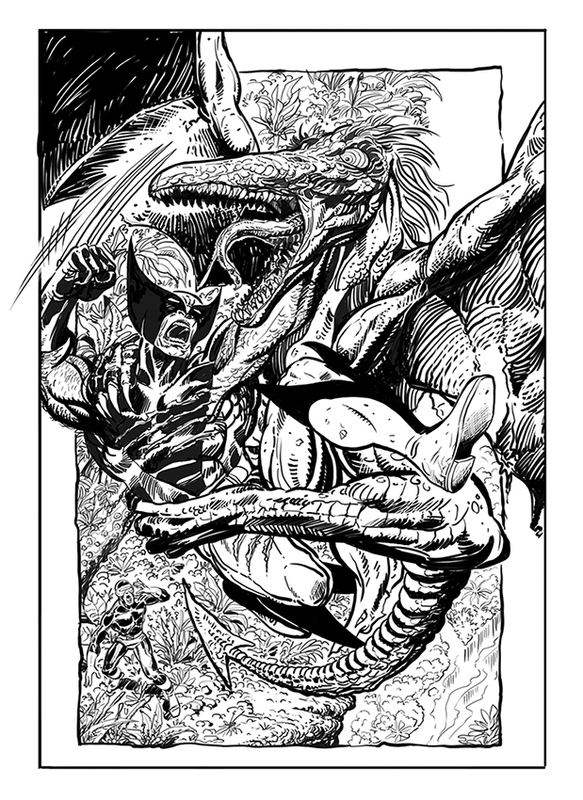 Okay, so I'm thinking the retro coloring ideal would be the subdued newsprint Marvel 'look'; check out some of the Man-Things comics for the savage land. The further back you go the better the coloring usually. I do like the idea or skies being some kind of blue though, not changing to yellow or red for no reason from panel to panel. They can change for effect I suppose of a character becoming suddenly angry. I think the best colorists were Marie Severin and later Glynis Oliver (erstwhile Wein), but I did see Glynis make mistakes now and then (just finished reading Marvel: The Lost Generation), who knows what the time constraints may've been however. I think I appreciate later Byrne with either Byrne inks or Al Milgrom... there are some astonishingly good moments in ink on these later and supposedly scorned comics that rate with the all-time greats like Toth or Caniff. Milgrom is a weirdo though as he could even ink Michael Golden really well where you might've thought that'd be a mismatch. The finished page does look much sharper and more detailed at full resolution, but this is the best quality scan I can figure out to post. You could always post a crop of Cyclops to show more. I think your work is good, Tony, but I suspect increased resolution won't change anything in term of Cyclops' totally black leg being faithful to the details provided by the pencils. …being faithful to the details provided by the pencils. Which doesn't seem to be much of a concern, here. Tony, there is a lot more of your rendering style than JB's on this splash page. I don't understand the changes to Wolverine's abs and torso that make his right side very angular and his left undefined. The shadows in general on his right foot, leg and upper body are your more rendering technique than JB's. The jungle foliage around Cyclops looks more like Kirby crackle now, but that could be the low rez image. The background above the figures seems to be an a strange angle to the background below the figures. Why change Sauron's beak area to make it look connected to his right forearm? The line defining the top of his head should carry all the way down without a break or it is a HUGE distraction. We tend to gravitate toward eyes and faces when we look at figure drawing so if there is something out of place it sticks out quite a bit. As I mentioned earlier, I find these pages that JB shared with us have a great deal in common with John Buscema's work. 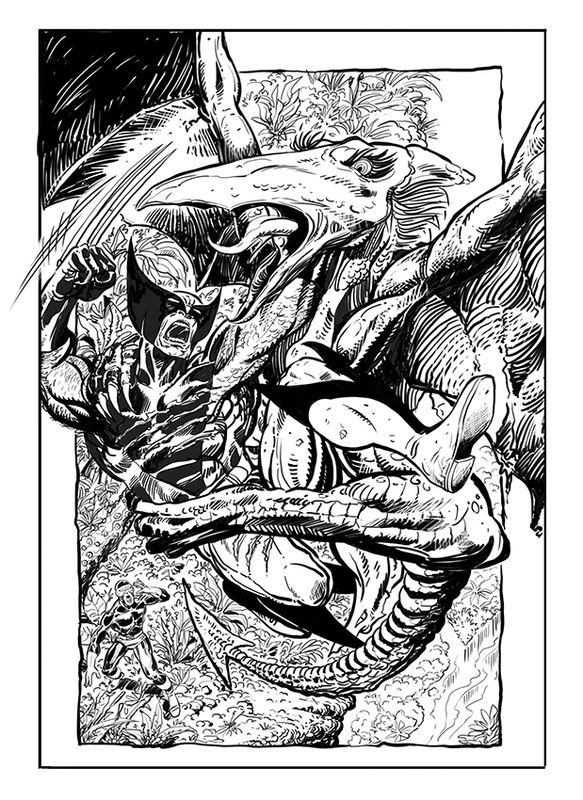 Might I suggest you search up some of Big John's pencils and inks for hints or practice? You clearly have control over the tools you are using to ink, but the results look like you were inking breakdowns because there is more of your work on the page than JB's work. You have an interesting, realistic style that reminds me of Mark Texeira or Buzz (Aldrin Aw). Well I could only be faithful as much as I could make out on the the original page. It doesn’t seem to be as sharp as the other page I tried. The rock formation on the top, or what I think is rock formation, is what I see on the pencil page, which I’ve probably misinterpreted. I tried to follow the pencils on Wolverine’s chest repeatedly but I just couldn’t make it work along with his right leg. None of this should mean that I find shortcomings in John’s pencils, it’s obviously my own. Like I’ve said before, I’ve never inked anyone else’s pencils and this is a learning process for me where I can get feedback from not only fans of the artist but the artist himself. I was happy with most of Sauron. Figuring out he leather like wing texture was fun so I learned that at least. Thanks for all the feedback guys. Tony, I completely understand. I did a page; the one with Kitty falling and Nightcrawler trying to save her, and it was heavy handed and didn't make the images pop off the page. I've spent most of my time practicing on other pencils and looking over other artists to improve before I give one of these pages another go. The JB artifact edition is helpful because you get a chance to see the actual line weights and techniques that Terry Austin was employing on Uncanny X-Men, but JB's pencils have changed a bit since then. Anyway, I'm trying to be constructive. You have a distinct and realistic style. That panel you did of the jet's wheel looks almost like a photo. But your style is showing more than JB's in the finished images. To be honest l’ve always been more of a fan when John inked his own work like FF and OMAC. I tend to gravitate to Neal Adams, Aparo, Toth, Adam Hughes styled art. It’s funny I was never a fan of X-Men stuff so I always think of Terry’s inks over Marshall Rogers on Detective Comics before anything else and I recently looked up a reprint of his time on X-Men and I don’t know who at Marvel “remastered” it but it looked terrible, no where near as good as I remembered it. I've seen some quality inking here. I like what Eric Ladd, and now Oliver Denker, have shown. The ideal is to lose nothing but hopefully to enhance as much as possible (enhance readability and the viewer's focus in the way intended by the pencils). Actually changing something is touchy as it's like trespassing. See my problem is I can’t reconcile where Sauron’s left leg would meet with his torso and his tail doesn’t seem to come out in the right spot. What little I know of his look is that chest and legs are vaguely human proportions? This is a rough of where I drop Wolverine down a tad change this right leg and extend Sauron’s torso and alter his right arm position. By this time I’ve pretty much gone full “Ordway” and lost whatever little John Byrne I managed to keep originally. I think I’ll have to abandon this attempt until I get better.